• Football is played on a marked field measuring 100 yards, an end zone at each end of the field. The field is marked with hash marks, each being a yard apart. The fifty yard line marks the center of the field with each yard line counting down until a team reaches its end zone on either side. • Football is played with an oblong leather ball. Each team consists of an offense (the team trying to get the football in the end zone) and a defense (the team trying to stop them. There are eleven players on each side of the ball. • The defense can consist of 3 or 4 defensive lineman, 3 or 4 linebackers, 2 cornerbacks, and 2 safeties. • The offense usually consist of a quarterback, a half back, a full back, 2,3, or even 4 wide receivers, an offensive line that consist of 2 guards, 2 tackles, a center (snaps the ball), and finally tight ends. • There is a third group that may take the field. They are called special teams and will contain a kicker or punter (if on offense). This group is usually made up of second and third string players. • The game starts with a kickoff and the receiving team then uses its offense to try to get to their end zone on the opposite end of the field. • When a team reaches the end zone they are rewarded with 6 points. At that point they then get the choice to either kick an extra point (through the goal posts) or try for a 2-point conversion. A 2-point conversion is accomplished by running or passing the ball into the end zone starting from just outside the end zone. • If a team fails to make it all they way down to the end zone they may opt to kick the ball through the goal posts from their current location. If the kicker is successful in doing this it is called a field goal and the respective team is awarded 3 points. • The final way a team can score points is through a safety. This is done when a defense knocks down the person with the ball into their own end zone. The defenses team is awarded 2 points and possession of the ball for this feat. An offense starts off wherever the player receiving the kickoff is knocked down, or wherever a turnover occurs. They then have 4 chances called downs to move the ball 10 yards. They can do this through the air or on the ground. A center starts each play with the ball. The quarterback yells “hike!” and the center delivers him the ball (through his legs). The quarterback has 3 choices at this point. He can hand the ball to one of his running backs and they will in turn try to run as far as they can before getting knocked down. The second choice would be to throw the ball to one of his receivers. The receiver, tightened, and backs are all eligible to catch the ball. If the ball isn’t caught it is called dead and the offense loses that down. After a receiver catches it, he then tries to run as far as he can before getting knocked down, or tackled. If he makes it 10 yards then the downs are reset (returns to 1st down). If a defensive player catches the ball, it is considered an interception and his/her team’s offense takes over. 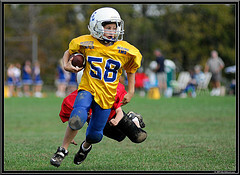 The final choice of a quarterback is to just run (called a quarterback sneak); this is seldom done since it can result in the quarterback being injured. If an offense does make it to the end zone, they receive the 6 points and attempt either an extra point or 2-point conversion. Immediately after this point, the special teams come on the field and kick the ball off to the other team. If an offense fails to make it 10 yards on 3 plays they have an option to punt, where the football is dropped and kicked before it hits the ground by the punter. Punting is done to give the opposing team a larger distance to their end zone. The defense’s purpose is to stop the offense and get the ball back for their own offense. The defensive lineman’s objective is to either stop the running back from getting any yards or knockdown the quarterback before he throws the ball; this is known as a sack. The linebackers can do the same as the lineman or they may try and keep the receivers from catching the ball. The cornerbacks stay with the receivers and try to either intercept the ball or simply prevent the receivers from catching the ball. An interception is a type of turnover; the ball goes back to the other team’s offense. The safeties try to the same as the cornerbacks except they stay further back to keep the offense from completing a play that will gain them a substantial amount of yards. If at any time an offensive player has possession of the football and then drops it, it is called a fumble and the play can be picked up by either team. •Each game consists of 4 quarters. •Each quarter consists of 15 minutes (in the NFL) of live playing time. •An overtime quarter is required if the game ends in a tie. •The first team to score either a field goal or touchdown in overtime wins the game. •Penalties are assessed by referees when a player breaks a rule. •The punishments for breaking a rule are a loss or gain of yards, a loss of down, or a combination of the two. •Penalties can also result in a redo of the play. The team with the most points at the end of the game wins. Hopefully you now know on a basic level how to play football. Have fun! Copyright howtoplaystuff.com. All Rights Reserved.